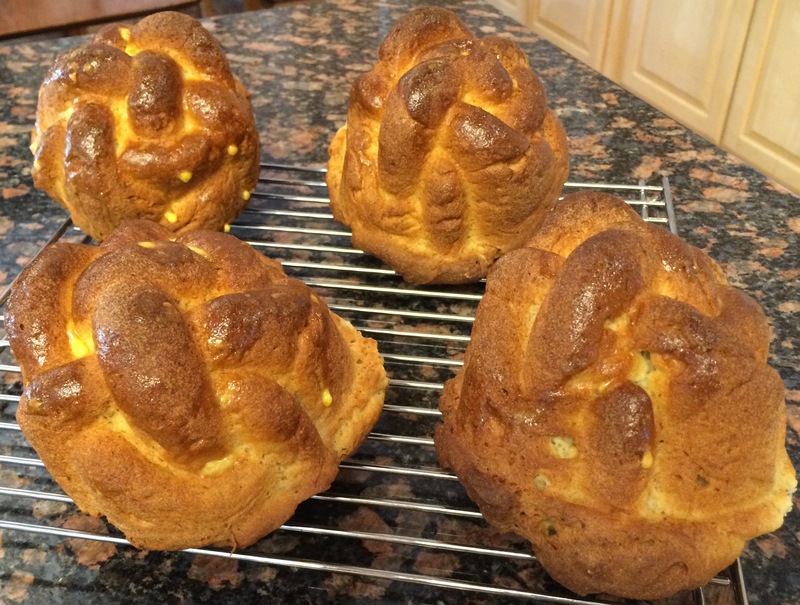 This is my standard challah recipe that I make every Friday for Shabbat. After a year or two of experimenting and baking challot that Josh barely tolerated and most of us didn’t touch, I tried a recipe from a bag of Potato Starch (Bob’s Red Mill) that was pretty good. I made a few changes, and eventually it evolved into our regular Friday night fare, and everyone has been happy with it. 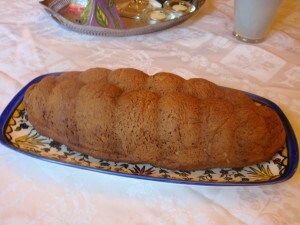 Later I’ll post the challah I make for the gluten contingent of the family. 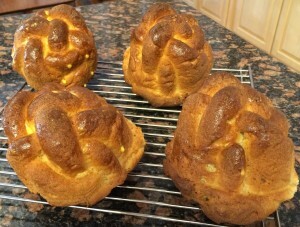 I bake it in a Kaiser Bakeware 15-Inch Classic Braided Loaf Pan so it looks more like challah, but you can also make this in one large or two small loaf pan(s). Might have to adjust the baking time. This recipe makes one loaf, or two small ones in smaller pans. If you want to make two large challot, don’t double – make two separate recipes. It is not successful without a pan because it spreads out too much. I don’t know if this will work without a mixer. Probably, if you have a strong arm – you might want to double the beating time. I think part of the lightness of this bread comes from the beating, but maybe it doesn’t matter. It is supposed to work fine in a bread maker but I haven’t tried it because ours is too full of gluten. I also want to mention that in my experience, the measurements do not need to be particularly precise. Since you’re not kneading the dough, as long as the amounts are roughly the same, the challah will be good. 2 Tbsp some other kind of GF flour: experiment! lately I’ve been using masa harina, yum. Preheat oven to 200°. Grease bread pan. Add yeast and 1 tsp sugar to the warm water and let sit for 5-10 minutes to proof. Combine the rest of the dry ingredients in a bowl, including the remaining sugar, and stir with fork or wire whisk to mix well and get out all the lumps. Mix the other wet ingredients together – eggs, vinegar & oil. Combine the wet, the dry, and the yeast in the mixer bowl. By the way, sometimes I don’t bother with all these steps and just dump everything together in the mixer bowl and it usually works fine. Just don’t cook the eggs in the warm water. Mix on low to blend to blend a little, just so the starches don’t fly all over the kitchen, then mix on medium for 2 minutes. Scrape sides if necessary. Glop the dough (batter) into greased bread pan. Turn off oven, place pan in oven, cover loosely with foil tent and let rise for ½ to 1 hour, ‘til double or ‘til you’re tired of waiting. Remove pan from oven and preheat oven to 375°. Uncover and set the foil aside because you’ll use it again soon. Bake at 375° for 1 hour, covering loosely with foil tent after the first 20 minutes. (Variation: remove from oven 15 minutes before done and invert onto cookie sheet. Glaze with egg yolk mixed with one tsp water, then return to over and bake uncovered for the rest of the time.) Invert out of pan and cool on rack, or just start Shabbat right away and eat it hot. Now Josh can’t eat oats so I like to make two kinds of GF challah when he’s here. Today I divided this recipe into four small challettes using a silicone mold . and baked uncovered for about 10 more minutes. 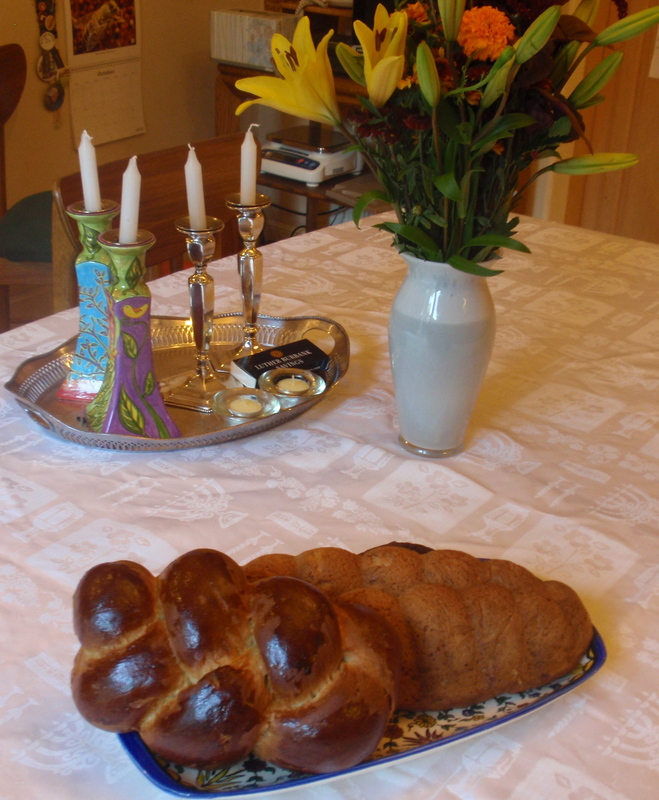 Served one challette as one of the pair for shabbat dinner and froze the other three for future Josh visits. hahaahahahha no i was just following her directions like a dutiful daughter and making comments! Oh yum. Looking forward to hearing how it goes! – Made 1 recipe, spooned it into 12 muffin tins (about half full) and a 1-qt (5-1/2″ diameter) glass Pyrex dish. – Baked the tiny ones for 30 minutes, covering after 10. Froze those for future Shabbats. Will let you know how they turned out. – Baked the larger one for the normal hour, covering after 20, and it turned out great, although it was still too big for 5 people just wanting a ritual amount. It would be handy to have some 3″ baking dishes.